Having emerged from the dark tunnel of financial matters I am having my first proper week back in the shop and I am so happy to be here! I have just been unpacking two enormous boxes of goodies from Moulin Roty and am absolutely thrilled with all the new products they are launching this year. 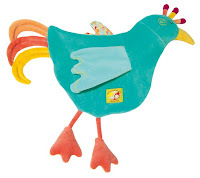 Pictured is a gorgeous bird rattle from their new Balthazar & Valentine range - isn't he gorgeous? To my mind he is absolutely 'of the moment' in terms of his colour and fabrics, and that lovely mixture of classic and quirky. I am going to be sending a picture over to Country Living in the next few minutes, I am determined to get something into their Emporium over the summer! There are a couple of other wonderful new product ranges to mention but I'll save them until later today and create a bit of anticipation..! It's so great to see you back! Thanks for leaving me a comment, I have thought about you over the last few weeks. Aahhh how cute is that. Here's hoping for a springy spring and plenty of contributions to the VAT vat.